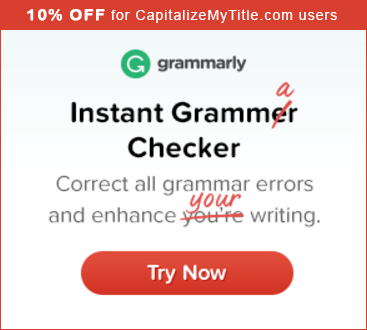 Capitalize My Title is an online tool that automatically capitalizes blog titles, essay titles, and article titles. We are actively seeking sponsors. Engage with our very active audience (45% of our audience use the site regularly) and help build your brand. We offer a limited amount of banner space on our pages to allow your advertisements to be seen by the most amount of people. We are willing to place the banner ads wherever you’d like and we are willing to place targeted banners on certain pages as well. If you are looking for a different advertising method, just contact us below. We primarily accept Paypal payments, but we are open to other methods. You can contact us at capitalizemytitle [@] gmail dot com for advertising opportunities.